These tasty Baked Ranch Chicken Strips are the perfect opportunity to get your kids in the kitchen with you. Pouring, crushing, dredging, spraying… kids (or spouses) can be involved every step of the way! With the extra hands helping in the kitchen, dinner time really can be family time. 1. Preheat oven to 350°F. Lightly spray a tin-foil lined baking sheet with cooking spray. 1. Place crushed corn flakes in a shallow dish. In a separate shallow dish, pour ranch dressing. 1. Lightly coat each chicken strip with ranch dressing, letting excess drip off. 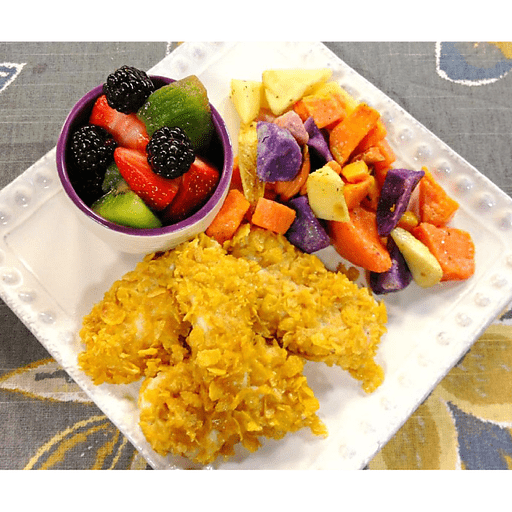 Dredge ranch-coated chicken strips in crushed corn flakes, pressing lightly, until evenly coated on both sides. Place coated chicken strips on baking sheet. 1. Bake chicken strips for 20-25 minutes until golden brown and crispy and chicken is cooked through. Calories 470, Total Fat 25g (Saturated 4.5g, Trans 0g), Cholesterol 105mg, Sodium 860mg, Total Carbohydrate 28g (Dietary Fiber 0g, Sugars 4g, Includes 0g Added Sugars), Protein 28g, Vitamin D 6%, Calcium 0%, Iron 60%, Potassium 10% *Nutritional values are an approximation. Actual nutritional values may vary due to preparation techniques, variations related to suppliers, regional and seasonal differences, or rounding.